The last year has seen plenty of ups and downs. Far-right political parties have continued to gain ground in countries around the world, particularly in Europe. For instance, Lega Nord, a far-right ultranationalist party, became the 3rd largest party in Italy following the 2018 general election. On October 2018, we saw the election of Jair Bolsonaro in Brazil--a fascist who has openly called for the murder of leftists--with capitalists in the US, Canada, and Europe cheering him on. Just a few weeks ago, on March 15, at least 50 people were massacred by white nationalists in a terrorist attack on two different mosques in Christchurch, New Zealand. In many cases, liberal politicians, pundits, and business owners have shown their complicity and willingness to collaborate with fascists for the sake of profit and power. At the same time, anti-fascists in the US and elsewhere have organized to push the burgeoning Alt-Right movement off the streets and back into the shadowy corners of the Internet. Ongoing efforts to deplatform and expose fascists, such as prominent white nationalist Gabriel Sohier-Chaput (aka Zeiger) in Montreal, have had a significant impact, substantially reducing their ability to recruit and organize in some areas. Former prominent Alt-right figures like Milos Yiannopoulos and Richard Spencer have also been successfully pushed out of the limelight. The continuing struggle against fascists extends into the games industry and the surrounding culture. In 2018, Game Workers Unite was founded, pushing for unionization and workplace organizing, with significant successes. There are chapters around the world, and outreach efforts have publicly connected the question of workers’ rights and the fight against abuse, discrimination and bigotry. 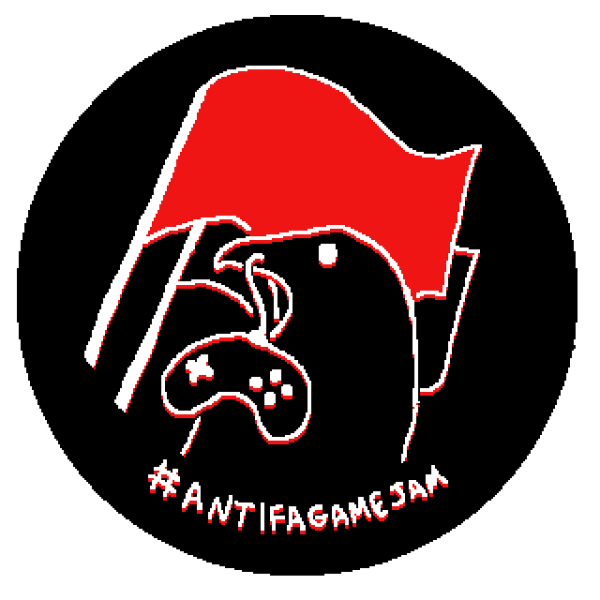 It’s in this context that we are launching the 2nd edition of the Antifascist Game Jam, in the hopes that it inspires others to join and carry on the fight against fascism! Want to fight fascism and make games? Then this is the jam for you! The theme for this jam is anti-fascism! If you’re not exactly sure what anti-fascism is, check out the FAQ below and/or get in touch with local anti-fascist groups. What if I’ve never made a game before? Do I have to make a digital game? No! All types of games are welcome, including street games, board games, tabletop games, LARPs (live-action role-playing games), videogames, mobile games, mods, or any other game-like thing you want to make! Do I have to finish my game or post it online? Don’t worry about finishing your game--the point is to have fun making games together, and set the stage for future collaborations. Even if you never get past the brainstorming session, that’s ok! Coming up with game ideas can be just as fun as making them. If you want to post your game online to share with others you can, but there’s no pressure! This jam is anti-hierarchical, so there are no judges or prizes. The goal isn’t to try to make the best game ever, but to have a good time and learn from one another. No one should get to have the final say over what a “good game” looks like--we all have different experiences, tastes, and capacities, and there’s nothing wrong with that! Is it ok to punch Nazis? Fascism is a movement that emerges during a period of capitalist crisis, and has its mass base in the middle class or "petite bourgeoisie". During the crisis, members of the middle class are faced with the prospect of losing their position of relative privilege, and being pushed down into the ranks of the working poor. Some middle class people join fascist movements and turn against marginalized or persecuted groups in the hopes of securing their position above them through organized violence, mass deportations, genocide, and imperialism. Fascist movements use marginalized people as scapegoats, blaming them for all the ills of society, and turning people’s attention away from the people in power and the capitalist institutions that gave rise to the crisis in the first place. This is why fascist groups often receive money and support from rich business owners who recognize that fascism benefits them, while hurting the marginalized, working class people who are the main targets of fascist violence. Fascism can also be seen as a reaction to progressive movements that are fighting back against oppression--a last-ditch attempt to reinforce existing hierarchies, and prevent working class revolt. This is why fascists have historically targeted communists, anarchists, and other far left groups whose politics are directly opposed to fascism. Ok, so what is anti-fascism? Fascism grows, in large part, because its presence is accepted and tolerated by the majority of people. Very few people actually completely buy in to fascist beliefs or join openly fascist organizations, but plenty of people do nothing when these organizations, say, decide to hold a rally, or partner with front groups that are less openly fascist, but still push a right-wing, racist agenda. Anti-fascists are people who do not want fascism to grow and gain power, and have decided to do something about it. Anti-fascism is a movement made up of lots of different people who are taking steps to defend themselves and their communities against the fascist threat, using a wide variety of tactics. Although anti-fascists are often demonized by the media, who portray them as dangerous radicals, many anti-fascists are actually putting themselves in extreme danger by standing up to fascists and their supporters (which often include cops). Fascism ultimately affects all of us, but sitting back and waiting for it to go away isn’t going to work. We need to build a mass movement, one that is opposed to fascism and to everything it represents. Ena͞emaehkiw Wākecānāpaew Kesīqnaeh. Fascism & Anti-Fascism: A Decolonial Perspective. J. Sakai. The Shock of Recognition. Michael Parenti. Blackshirts and Reds: Rational Fascism and the Overthrow of Communism. Zak Cope. Divided World, Divided Class. Leon Trotsky. Fascism: What It Is and How To Fight It. William Robinson and Mario Barrera. Global capitalism and twenty-first century fascism: a US case study. Josephine Armistead. The Silicon Ideology and The Silicon Ideology Revisited. It’s Going Down. The New Neo-Nazis: How Matthew Heimbach is Building a Racist Network Across the US. Matthew Lyons. Calling them "alt-right" helps us fight them. Cindi Milstein. This Is What Community Self-Defense and Solidarity Looks Like, or Should! Anti-Fascist News. The Complete Anti-Fascist Reading List. Vous voulez combattre le fascisme et créer des jeux? Ce jam est pour vous! Le thème de cette jam est l’anti-fascisme! Si vous n’êtes pas vraiment sûr.e de ce qu’est l’anti-fascisme, jetez un coup d’oeil à la FAQ ci-dessous et/ou entrez en contact avec vos groupes anti-fascistes locaux. Que faire si je n’ai jamais fait un jeu auparavant? Est-ce que je dois faire un jeu digital? Non! Tous les types de jeux sont les bienvenus, incluant les jeux de rue, les jeux de plateau, les jeux de table, les jeux de rôle grandeur nature, les jeux vidéos, les jeux sur mobile, les mods, ou toute autre chose similaire à un jeu que vous avez envie de créer! Est-ce que je dois finir mon jeu ou le mettre en ligne? Ne vous faites pas trop de souci pour finir votre jeu - le but est de passer un bon moment en faisant des jeux ensemble, et de préparer le terrain à de futures collaborations. Même si vous en restez au stage du brainstorming, c’est totalement OK! On peut prendre autant de plaisir à imaginer des idées qu’à les réaliser. Si vous voulez mettre votre jeu en ligne pour le partager avec les autres c’est encouragé, mais pas de pression! Cette jam est anti-hiérarchie, donc il n’y a pas de juges ou de prix. Le but n’est pas de créer le meilleur jeu du monde, mais de passer du bon temps et d’apprendre les un.e.s des autres. Personne ne devrait avoir le mot final sur ce que constitue un “bon jeu” - Nous avons tous des expériences, des goûts, et des capacités différentes, et il n’y a aucun problème avec ça! Est-ce que c’est OK de taper sur les Nazis? Le fascisme est un mouvement qui émerge en période de crise du capitalisme, et qui trouve sa base dans la classe moyenne ou "petite bourgeoisie". Pendant la crise, les membres de la classe moyenne se retrouvent face à la possibilité de perdre leur position de relatif privilège, et de rejoindre les rangs de la classe travailleuse pauvre. Certains sont de ce fait attirés par les mouvements fascistes, et se tournent contre les groupes marginalisés et persécutés dans l’espoir de sécuriser leur position sur eux par la violence organisée, les déportations de masse, le génocide, et l’impérialisme. Les mouvements fascistes utilisent les personnes marginalisées comme boucs émissaires, les accusant de tous les maux de la société, et détournant l’attention loin des puissants et des institutions capitalistes qui produisent la crise en premier lieu. C’est pourquoi les groupes fascistes reçoivent souvent le support et le financement de riches propriétaires d’entreprise qui reconnaissent que le fascisme leur est avantageux, tout en nuisant aux personnes marginalisées de la classe travailleuse, qui sont les cibles principales de la violence fasciste. Le fascisme peut aussi être vu comme une réaction aux mouvements progressistes qui combattent les oppressions - un effort désespéré de renforcer les hiérarchies existantes, et d’empêcher une révolte de la classe travailleuse. C’est pourquoi les fascistes ont historiquement ciblé les communistes, les anarchistes, et les autres groupes de gauche radicale, dont les politiques sont diamétralement opposées au fascisme. Ok, alors qu’est-ce que l’anti-fascisme? Le fascisme avance, en grande partie, parce que sa présence est acceptée et tolérée par la majorité des gens. Ce n’est que très peu de gens qui adhèrent totalement à l’idéologie fasciste ou qui rejoignent des organisations ouvertement fascistes, mais la plupart du monde reste inactif lorsque ces organisations décident par exemple de tenir une démonstration, ou de s’allier à des groupes moins ouvertement fascistes mais qui avancent pour autant un agenda de droite raciste. Les anti-fascistes sont des gens qui ne veulent pas que le fascisme gagne en pouvoir, et qui ont décidé de faire quelque chose pour l’en empêcher. L’anti-fascisme est un mouvement composé d’un grand nombre de personnes différentes qui prennent des mesures pour se défendre et défendre leurs communautés contre la menace fasciste, en utilisant une diversité de tactiques. Bien que les anti-fascistes soient souvent démonisé.e.s dans les médias, qui les présentent comme des extrémistes dangereux, un grand nombre d’anti-fascistes se mettent en grave danger en s’opposant aux fascistes et à ceux qui les soutiennent (ce qui inclut souvent la police). Ultimement, le fascisme nous affecte tous, mais se mettre la tête dans le sable en attendant qu’il s’en aille ne mènera à rien. Pour réussir nous devons former un mouvement de masse, qui puisse s’opposer au fascisme et à tout ce qu’il représente. Où puis-je en apprendre plus? Quer lutar contra o fascismo e fazer jogos? Então está é a sua jam! Se você não tem muita certeza do que é antifascismo, dá uma olhada nas perguntas frequentes abaixo e/ou entre em contato com grupos antifascistas locais. Mas e se eu nunca fiz um jogo antes? Não se preocupe! Nós vamos postar um guia com links para ferramentas acessíveis e fáceis de usar, tutoriais e outros recursos. Eu tenho que fazer um jogo digital? Não! Todo tipo de jogo é bem-vindo, incluindo brincadeiras de rua, jogo de tabuleiro ou cartas, LARPs, videogames, jogos de celular, mods de jogos ou qualquer outra coisa meio que parecida com jogos que você queira fazer! Eu tenho que terminar meu jogo ou postar online? Não se preocupe em terminar o jogo - o objetivo é se divertir fazendo jogos com outras pessoas e preparar possíveis futuras colaborações. Mesmo se você nunca passar da parte de ter ideias, tudo bem! Ter ideias para jogos pode ser tão divertido quando fazê-los. Se você quiser postar seu jogo online para compartilhar com outras pessoas você pode, mas sem pressão! Essa jam é anti-hierárquica, então não tem juízes nem prêmios. o objetivo não é tentar fazer o melhor jogo da história, mas fazer algo legal e aprender uns com os outros. Ninguém deveria ter a palavra final do que é “um bom jogo” ou como deveria ser - todas as pessoas têm experiências diferentes, gostos e capacidade e nçao tem nada de errado com isso! E pode dar soco em nazistas? Fascismo é um movimento que surge durante um período de crise capitalista, e tem sua base na classe média. Durante a crise, membros da classe média têm de encarar o risco de perder sua posição de privilégio relativo e descer para as classes operárias. Algumas pessoas de classe média se juntam a movimentos fascistas e se viram contra grupos marginalizados ou perseguidos na esperança de garantir sua posição acima deles através de violência organizada, deportações em massa, genocídio e imperialismo. Movimentos fascistas usam pessoas marginalizadas como bodes expiatórios, culpando-as por todos os problemas da sociedade e desviando a atenção das pessoas no poder e das instituições capitalistas que deram origem à crise. É por isso que grupos fascistas frequentemente recebem dinheiro e apoio de donos de negócios que reconhecem que o fascismo os beneficia, enquanto fere as pessoas trabalhadoras e marginalizadas que são alvo da violência fascista. Fascismo também pode ser visto como uma reação a movimentos progressistas que lutam contra opressões - uma tentativa desesperada de reforçar hierarquias e impedir a revolta da classe trabalhadora. É por isso que historicamente fascistas atacam comunistas, anarquistas e outros grupos de esquerda que se opõem diretamente ao fascismo. Ok, e o que é o antifascismo? O fascismo cresce, em grande parte, porque sua presença é aceita e tolerada pela maioria das pessoas. Poucas pessoas realmente concordam plenamente com as crenças fascistas ou se juntam a organização abertamente fascistas, mas muitas não fazem nada quando essas organizações, por exemplo, decidem fazer manifestações ou fazem parcerias com grupos de fachada que são menos explícitos mas ainda defendem ideias racistas e de extrema-direita. Antifascistas são pessoas que não querem que o fascismo cresça e ganhe poder, e que decidiram fazer algo quanto a isso. Antifascismo é um movimento feito de uma diversidade de pessoas que estão realizando ações para defender a si mesmas e suas comunidades contra a ameaça fascista, usando uma variedade de táticas. Apesar de serem demonizadas pela mídia, que definem antifascismo como um extremismo perigoso, a maioria de antifascistas se colocam em perigo ao enfrentar fascistas e seus apoiadores (o que frequentemente inclui a polícia). Finalmente, o fascismo afeta a todxs, mas ficar sem fazer nada e esperar que ele passe não vai adiantar. Nós precisamos construir um movimento de massa que se oponha ao fascismo e a tudo que ele representa. Vuoi combattere il fascismo creando giochi? Allora questa è la jam che fa per te! Il tema di questa jam è l'anti-fascismo! Se non sei sicur* di cosa significa il termine "anti-fascismo", dai un'occhiata alle FAQ sottostanti e/o contatta i gruppi anti-fascisti del tuo territorio. Devo creare per forza un gioco digitale? No! Tutti i tipi di giochi sono ben accetti, inclusi street game, tutti i tipi di giochi da tavolo, giochi di ruolo dal vivo, videogiochi, giochi per dispositivi mobili, mods, e qualsiasi cosa si avvicini ad un gioco! E' obbligatorio completare il gioco o pubblicarlo online? Non è necessario completare lo sviluppo del gioco -- lo scopo della jam è divertirsi a creare giochi tutti insieme, e porre le basi per collaborazioni future. Può anche capitare di non riuscire a superare la fase di brainstorming: non preoccuparti, andrà bene lo stesso! La semplice ideazione di un gioco può risultare divertente quanto metterla in pratica. Se vuoi, puoi pubblicare il tuo gioco online e condividerlo con altri, ma non sentirti costretto a farlo! Questa jam si oppone ad ogni tipo di gerarchia, quindi non ci sono giudici nè premi. L'obiettivo non è fare il gioco migliore del mondo, ma divertirsi e imparare dagli altri. Nessuno dovrebbe permettersi di giudicare un gioco -- tutt* noi abbiamo esperienze, gusti e capacità diversi, e non c'è nulla di male in questo! Posso prendere a pugni i Nazisti? Il Fascismo è un movimento che emerge durante un periodo di crisi capitalista, che si rivolge al ceto medio o piccolo borghese. Durante la crisi, i membri della classe media si trovano di fronte alla prospettiva di perdere la loro posizione con relativi privilegi, e ritrovarsi nella classe operaia. Alcuni del ceto medio si uniscono ai movimenti fascisti per opporsi ai gruppi perseguitati e marginalizzati, con la speranza di assicurarsi la predominanza su di essi per mezzo di atti violenti organizzati, deportazioni di massa, genocidi e imperialismo. I movimenti fascisti usano gli emarginati come capri espiatori, accusandoli di tutti i mali della società, e distogliendo l'attenzione della gente dai poteri forti e dalle istituzioni capitaliste, reali fautori della crisi. Ragion per cui molti gruppi fascisti sono supportati e finanziati da imprenditori che sperano di ricevere benefici sfruttando la classe operaia, principale obiettivo della violenza fascista. Il fascismo può anche essere visto come una reazione ai movimenti che si oppongono alle oppressioni, un disperato tentativo di rafforzare gli equilibri di potere già esistenti e prevenire la rivolta delle classi operaie. Per questa ragione, storicamente i fascisti prendevano di mira comunisti, anarchici e altri gruppi di estrema sinistra, i cui politici sono direttamente contrapposti al fascismo. Il fascismo si diffonde soprattutto perchè la sua presenza è largamente accettata e tollerata. Sono davvero poche le persone che sostengono completamente i dettami fascisti o che si uniscono a gruppi dichiaratamente fascisti, ma la maggior parte della gente non fa nulla quando questi gruppi dicono, organizzano manifestazioni o si legano ad altri gruppi non apertamente fascisti, ma che cercano di inculcare una visione razzista di destra. Gli anti-fascisti sono persone che cercano di arrestare l'avanzata del fascismo, e hanno deciso di fare qualcosa. Il movimento anti-fascista è costituito da gruppi di persone che hanno deciso di prendere una posizione per difendere loro stessi e la comunità di appartenenza dalla minaccia fascista, usando svariati metodi. Anche se l'anti-fascismo è spesso demonizzato dai media, che li dipingono come pericolosi radicali, molti anti-fascisti sono piuttosto esposti al rischio di violenza e minacce da parte dei sostenitori fascisti (che spesso sono esponenti delle forze dell'ordine). Il fascismo colpisce tutti noi, ma stare fermi ad aspettare che passi non servirà a nulla. Bisogna costruire un movimento globale che si opponga al fascismo e a tutto ciò che rappresenta. Vorrei maggiori informazioni al riguardo. Dove posso reperirle? Este último año ha tenido sus altibajos. Partidos políticos de derecha extrema han continuado ganando terreno en países alrededor del mundo, particularmente en Europa. Por ejemplo, Lega Nord, un partido de extrema derecha ultra-nacionalista, se volvió el 3er partido más grande en Italia luego de la elección general de 2018. En octubre de 2018, vimos la elección de Jair Bolsonaro en Brasil —un fascista que ha reclamado abiertamente por el asesinato de izquierdistas— aclamada por capitalistas en Estados Unidos, Canadá y Europa. Hace apenas unas semanas, el 15 de marzo, al menos 50 personas fueron masacradas por nacionalistas blancos en un ataque terrorista en dos mezquitas diferentes en Christchurch, Nueva Zelanda. En muchos casos, políticos liberales, autoridades y empresarios han mostrado su complicidad y voluntad de colaboración con fascistas en miras de fomentar su lucro y poder. Al mismo tiempo, anti-fascistas en Estados Unidos y otros lugares se han organizado para sacar al movimiento incipiente alt-right de las calles y devolverlas a los rincones oscuros de internet. Esfuerzos continuados para deslegitimar y exponer a fascistas, como el prominente nacionalista blanco Gabriel Sohier-Chaput (alias Zeiger) en Montreal, han tenido un impacto significativo, reduciendo sustancialmente su habilidad de reclutar y organizarse en algunas áreas. Ex figuras prominentes alt-right como Milos Yiannopoulos y Richard Spencer también han sido exitosamente expulsadas del foco de atención. La lucha continua contra el fascismo se extiende hacia la industria de videojuegos y la cultura que la rodea. En 2018, Game Workers Unite fue fundada, abogando por la gremialización de la organización laboral, con éxitos significativos. Hay capítulos alrededor del mundo, y los esfuerzos de alcance han conectado públicamente el asunto de los derechos laborales y la pelea contra el abuso, la discriminación y el prejuicio. Es en este contexto que presentamos la 2da edición de la Antifascist Game Jam, con la esperanza de que inspire a otras personas a unirse ¡y a continuar la lucha contra el fascismo! ¿Quieres pelear contra el fascismo y hacer juegos? ¡Entonces ésta es la jam para ti! La International Anti-fascist Game Jam ocurrirá en múltiples locaciones en abril, incluyendo sedes locales en las ciudades canadienses de Toronto y Montreal, una sede en Bari, Italia, y con participantes de diferentes ciudades brasileñas y en Argentina. Cualquier persona puede participar en la jam online, que empieza el 1 de abril y sigue hasta el 30. La International Anti-fascist Game Jam es co-organizada por Curieux de Jeux / Game Curious Montréal, Ataque y Montréal Antifasciste. Si te gustaría hospedar una jam local en tu ciudad o pueblo, por favor contáctanos a gamecuriousmtl@mrgs.ca (inglés o francés). ¿Quieres luchar contra el fascismo y hace juegos? ¡Entonces ésta es la jam para ti! ¡La temática de esta jam es anti-fascismo! Si no sabes exactamente qué es el anti-fascismo, mira el FAQ (preguntas frecuentes) abajo y/o contacta grupos locales anti-fascistas. ¿Qué pasa si nunca hice un juego antes? ¿Tengo que hacer un juego digital? ¡No! Todo tipo de juegos son bienvenidos, incluidos juegos callejeros, de mesa, de rol, LARPs, videojuegos, juegos móviles, mods ¡o cualquier cosa jueguil que quieras hacer! ¿Tengo que terminar mi juego o publicarlo en línea? No te preocupes por terminar tu juego. El punto es divertirse y hacer juegos juntxs, y preparar el espacio para colaboraciones futuras. Incluso si nunca pasaste de la sesión de brainstorming, ¡está bien! Inventar ideas puede ser tan divertido como realizarlas. Si querés publicar tu juego en línea para compartirlo con otrxs podés, ¡pero no hay presión! Esta jam es anti-jerárquica, así que no hay jueces ni premios. El objetivo no es tratar de hacer el mejor juego del mundo, sino pasarla bien y aprender entre todxs. Nadie debería tener voto final sobre qué constituye un “buen juego”: todxs tenemos diferentes experiencias, gustos y capacidades, ¡y no hay nada de malo con eso! ¿Está bien pegarle a los nazis? El fascismo es un movimiento que emerge durante un período de crisis capitalista, y tiene su base masiva en la clase media o pequeño-burguesa. Durante la crisis, miembros de la clase media enfrentan el prospecto de perder su posición de privilegio relativo, y de caer en las huestes de las clases obreras y populares. Algunas personas de la clase media se unen a movimientos fascistas y se vuelven contra grupos marginados o perseguidos con la esperanza de asegurar su posición por encima de ellxs mediante la violencia organizada, las deportaciones masivas, el genocidio y el imperialismo. Los movimientos fascistas usan personas marginadas como chivos expiatorios, culpándolas por todos los males de la sociedad y alejando la atención de la gente al poder y las instituciones capitalistas que generaron la crisis en primer lugar. Es por esto que los grupos fascistas con frecuencia reciben dinero y apoyo de empresarios ricos que reconocen que el fascismo los beneficia, mientras hieren a las personas marginadas y obreras que son los principales objetivos de la violencia fascista. El fascismo también puede verse como reacción a los movimientos progresistas que están peleando contra la opresión: un último intento de reforzar las jerarquías pre-existentes y de prevenir la revuelta obrera. Por esto es que el fascismo ha históricamente atacado a comunistas, anarquistas y otros grupos de extrema izquierda cuyas políticas están diametralmente opuestas a las del fascismo. OK, entonces ¿qué es el anti-fascismo? El fascismo crece, en gran parte, porque su presencia es aceptada y tolerada por la mayoría de la población. Pocas personas compran totalmente las creencias fascistas o se unen abiertamente a organizaciones fascistas, pero bastante gente no hace nada cuando estas organizaciones, por ejemplo, deciden organizar una marcha, o unirse a grupos que son menos abiertamente fascistas, pero igual abogan por una agenda racista y de derecha. Anti-fascistas son las personas que no quieren que el fascismo crezca y gane poder, y han decidido hacer algo al respecto. El anti-fascismo es un movimiento conformado por diferentes personas que están tomando pasos para defenderse y a sus comunidades contra la amenaza fascista, usando una amplia variedad de tácticas. Aunque lxs anti-fascistas generalmente son demonizadxs por los medios, que lxs presentan como radicales peligrosxs, muchxs anti-fascistas se ponen en peligro extremo al pararse contra fascistas y sus partidarios (que con frecuencia incluyen a la policía). El fascismo en última instancia nos afecta a todxs, pero tranquilizarse y esperar a que se vaya no va a funcionar. Tenemos que construir un movimiento masivo, uno que se oponga al fascismo y a todo lo que representa. A 9 page tabletop game of second-by-second political action. We all have heard about fascism but, how do we identify it? Stop Donkey Trump in this arcade classic with new features, extras and more. Punching nazis is fun and good. A Fiasco playset based on intercine feuds of the American left escalated from a candle to a conflagration. A family dinner with your slightly racist uncle. A mini-game for Zx Spectrum about the 1-O 2017 Catalonia's self-determination referendum..
Este é um boardgame, antifascista, feito para você dar boas risadas com seus amigos enquanto quebra alguns dentes. The interactive story of the 1964 Brazilian military coup. Sometimes the words could be mortals! Think about it!